You may have seen the phenomena sweeping YouTube: videos of cats scared by cucumbers. It may seem harmless and hilarious but animal experts share another story. Experts warn that scaring your pets and causing them stress is probably not a good idea. Many are frustrated that the videos have become trendy and incite people to scare their pets for a laugh. Experts and pet-lovers alike call the cucumber trick, mean spirited, cruel, and lacking humanity. The reason cats are scared is because they would not typically see the cucumber on a floor, and a surprise object triggers their natural startled response. Some experts suggest that cats may also associate green with snakes, which are threatening predators. In addition, the cucumbers are often placed near feeding areas, a space cats consider a safety zone. 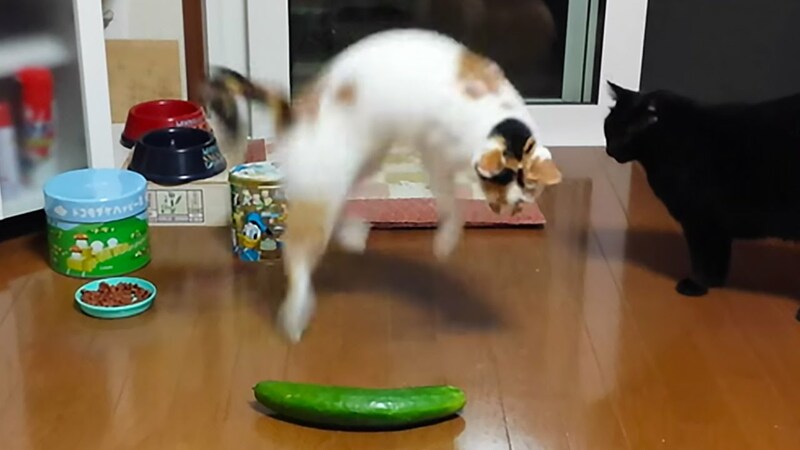 The cats jump in reaction, assuming cucumbers are threatening. Bringing new objects into your cat’s environment can be good mental stimulation, but your objective shouldn’t be to scare them. Experts suggest introducing items slowly or gradually over time. This is, of course, dependent on your cat’s personality and nature. Each cat reacts differently and should be treated as such. The moral of the day is to keep cucumbers, or any other surprise object, away from your cat. Surprising and scaring your cat is not ideal to their psyche, could cause them to injure themselves, or lead to stress. This entry was posted in Anxiety, Cats and tagged cat behavior, Cats, cats and cucumbers, cucumbers scare cats, scared cat, stressed cats on June 30, 2016 by admin. Summer has arrived and so have the ticks. Ticks are most active in the warm, summer months. They are typically found in heavily wooded areas, and are found in many places in Illinois, including the suburbs of Chicago. Much like humans, dogs are susceptible to tick-borne diseases and tick bites. Ticks can transmit many diseases and infections through their parasitic bite. Ticks are commonly known as transmitters of Lyme disease, Rocky Mountain spotted fever, and other diseases. Tick bites can be difficult to detect on pets. Tick-borne diseases can take one to three weeks to show symptoms, though not all ticks transmit diseases. Symptoms of a tick-transmitted infection include fever, lethargy, and weakness. If left untreated, these diseases can cause serious problems. Lyme disease, for example, can cause inflammation and joint pain, kidney problems, and difficulty breathing. If you suspect a pet has a tick-borne infection, seek medical care as soon as possible. To prevent tick born infections, carefully examine your pets when after they’re outside, especially in wooded areas. Make sure to finger comb through their fur to feel for any attached ticks. In addition to careful inspection, there are many medicine or formula based preventative solutions. Oral medications to prevent and kill ticks can be obtained from your veterinarian, and are easy to use. A common solution is a tick collar, though it is most useful for the head and neck area. There are numerous types of shampoos, powders, dips, and sprays that are preventative but can be a bit trickier to use effectively. Most of these solutions have to be applied or used regularly or monthly for optimal results. Lastly, make your yard less tick-friendly by keeping the lawn mowed, dense wood maintained, and free from woodpiles. Using one of these options doesn’t mean that you’re in the clear and should skimp on fur examinations. It’s important to check your pets continuously. If you discover a tick on your dog, be sure to remove the tick immediately. To remove a tick, use a pair of tweezers to grab the tick as close to the skin as possible. Pull backwards without twisting or crushing the tick’s body. Be sure to examine the area to make sure the head is removed and not lodged in the animal’s skin. After removal, wash your hands and your dog thoroughly. Clean the dog’s bite with an antiseptic to prevent infection. After sustaining a tick bite, your dog may experience itchy skin. Sooth this area with a topical cream or use a cold compress. Tick bites on dogs can be scary for pet owners. With careful prevention, monitoring, and treatment your pet should be able to happily frolic outside with minimal fear of ticks. This entry was posted in Dogs, Pet Care and tagged signs of lyme disease in dog, tick bite on dog, tick bite on pets, ticks, ticks and cats, ticks and dogs, ticks and pets on June 16, 2016 by admin.